I am not the biggest David Bowie fan in the world, but as a life long Rock & Roll fan he could not be ignored. Growing up on Rock Radio, Bowie was an icon & few hours went by without hearing a few Bowie tunes. As the video age came Bowie again was there on the front, I always remember seeing the video for "Fashion" when it came out (1980) & thinking how kool it was. As time passed & you put all his accomplishments together, you realize how many great songs David Bowie has. I may not like everything he did, but Bowie was great- here is a centerfieldmaz tribute. 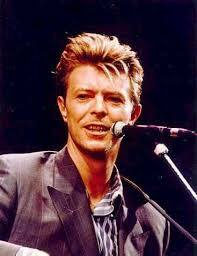 David Bowie was born David Jones on January 8th 1947, in London, England. 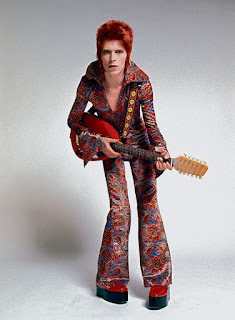 At the age of 19 he changed his name to David Bowie due to the success of the Monkees & their star named Davey Jones. Trivia: The Bowie reference was to that of American icon Jim Bowie, legend of the Alamo & the man whom the knife is named after. He first achieved success with "Space Oditty" in 1969 as the world was obsessed with the space age & walking on the moon. He then hit major stardom during the Glam Rock era which was huge in England & made a smaller impact on the United States as well. 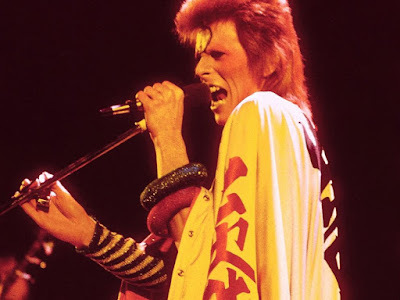 Bowie became the biggest of those acts, along with T-Rex (Marc Bolan & Bowie were rivals on the British music scene in the beginning), as his alter ego "Ziggy Stardust" became one of the biggest themes in rock music in the early seventies. The Rise & Fall of Ziggy Stardust & the Spiders From Mars went on to eventually sell 7.5 million copies & be his biggest album ever. The early seventies rock scene began to change from the sixties rock styles developing into other themes. First a darker, harder sound (Black Sabbath, Led Zeppelin, Deep Purple) which led to the hard rock, Heavy Metal genre. Then there were many concept themed albums coming out (The Who, Pink Floyd) and the concert world became a different place as well. Rock concerts were big big bucks & theatrical stage performances began to take shape (Rolling Stones, Alice Cooper, Elton John). David Bowie had a large part in the scene, as his concept story of "Ziggy Stardust" was followed by a very theatrical on stage persona. Bowie dyed his hair red, wore a space suit & even painted body. Although he was married to the now famous Angie Bowie (the woman who inspired the Stones- Angie) who was a huge influence on his career, many people thought he was gay. Whether it was a publicity stunt or not, he now had another lifelong fan base behind him. Bowie crossed not only sexual worlds but artistic worlds as well, mixing art, fashion & theatrical productions in his music. 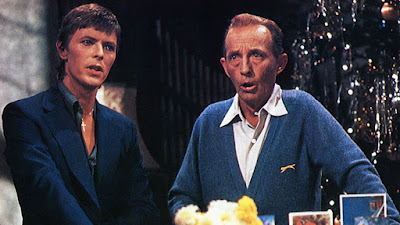 Bowie soon produced Moot the Hoople & wrote the glam rock classic- "All the Young Dudes" for them. Mick Ronson the bands guitarist had been Bowies guitarist for "Ziggy". 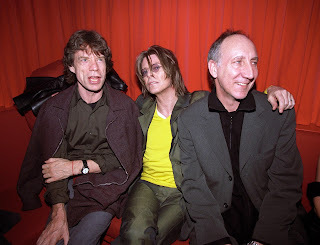 Bowie would go on to collaborate with many other great rock stars in the future. In 1976 he & an uncredited John Lennon would have a number one song with "Fame". 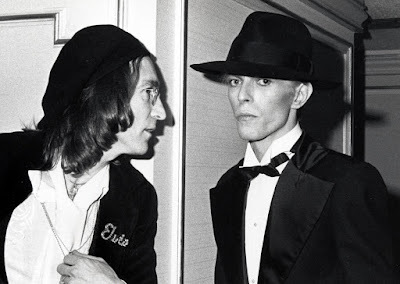 Trivia: In 1974 Bowie was staying in New York where he met John Lennon. The two jammed together at Electric Lady Studios in January 1975. With the help of guitarist Carlos Alomar's guitar riff the song Fame developed. Bowie later said the song was angry, nasty & malice toward the management group he had been working under at the time. Bowie said he never thought the song would be a success. 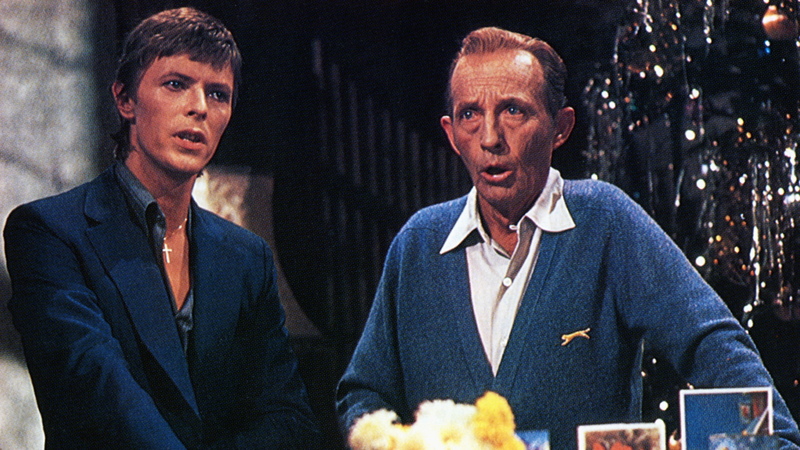 In 1977 he appeared on Bing Crosby's last Christmas TV show doing a duet with "Peace on Earth/The Little Drummer Boy". The song eventually was released a single & has been a Christmas song classic ever since. Bowie would sing background for Lou Reed, have a huge hit with Queen in 1981 with "Under Pressure". He later sued Vanilla Ice after the riff was stolen, they settled out of court for an undisclosed amount. His duet with Mick Jagger covering "Dancing In the Street" for Live Aid in 1985 was much anticipated but a huge flop. He worked with the Pat Methany Group on "This Is Not America" for the film Falcon & the Snowman. He also did notable efforts with Tina Turner & Annie Lennox (Freddie Mercury Tribute Concert). Some of the many great guitar players that have toured or recorded with him include, Mick Ronson, Peter Frampton, Stevie Ray Vaughn, Robert Fripp, Earl Slick, Chuck Hammer & Nile Rogers. After Ziggy he went into a funk & soul sound with Diamond Dogs (number one in England) followed by a big tour choreographed by Toni Basil. Next up, was a stay in Philadelphia which inspired the "Young Americans". This got him a gig on Soul Train as one of the first white performers to appear on the show. After the Heroes album he turned into a ore new wave sound, following the trend with Scary Monsters which as a number one in England. By 1983 he released Lets Dance which was huge success & led to the six month long, highly successful Serious Moonlight Tour. Later on into the nineties he would go to a more electronic sound & a bit less commercial sound. In 2001 he opened up the Concert For New York City singing America & Heroes. 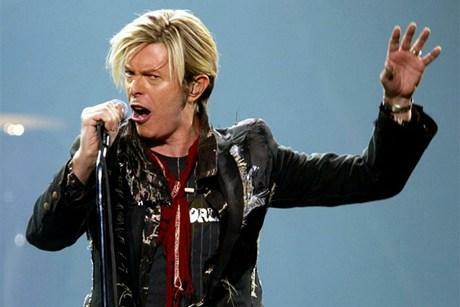 Bowie's theatrics not only led to elaborate concerts but to an acting career as well. Some of his roles include- The Man Who Fell to Earth, The Hunger (with Catharine Deneuve & Susan Sarandon) Just A Gigalo (with Marlene Dietrich), Labrynth, The Last Temptation of Christ (as Pontius Pilate), The Linguini Incident (with Rosanna Arquette), Zoolander & many stage productions most notably; The Elephant Man. David Bowie has certainly had a full life & been an important figure in rock music. He has been an inspiration to many artist in music, as well as art & in theater. 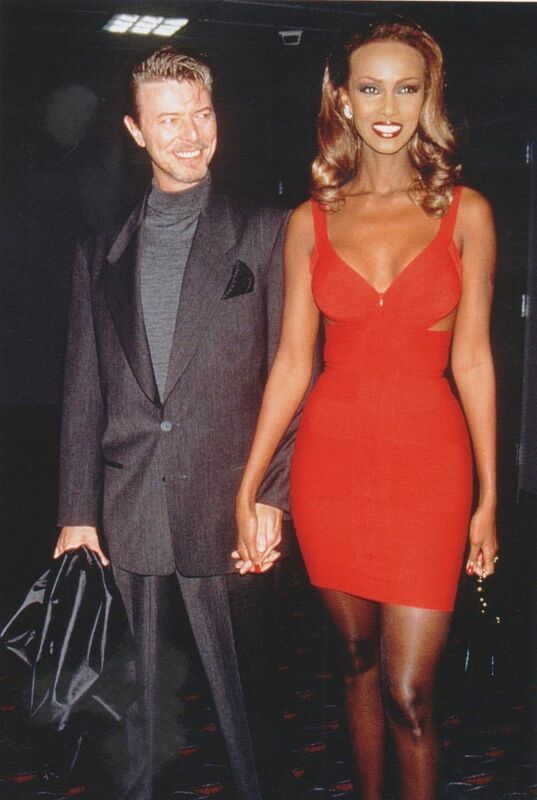 After his ten year marriage to Angela he eventually married the model; Iman. He has two children, one with each wife. he video "Lazarus" was already receiving high praise, but now knowing that he was dying it is very haunting. Even in death Bowie amazes us in his last goodbye! 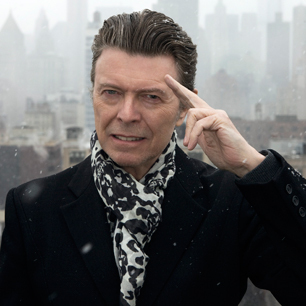 Trivia: An off Broadway production of Lazarus was in the making as Bowie was suffering from the cancer. 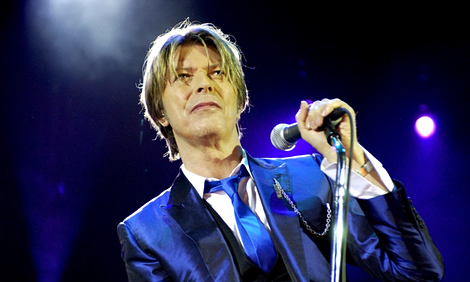 Great write-up :)RIP David Bowie.